So, for a change, it’s good to see a young woman in a Hindi film with a career she takes seriously. 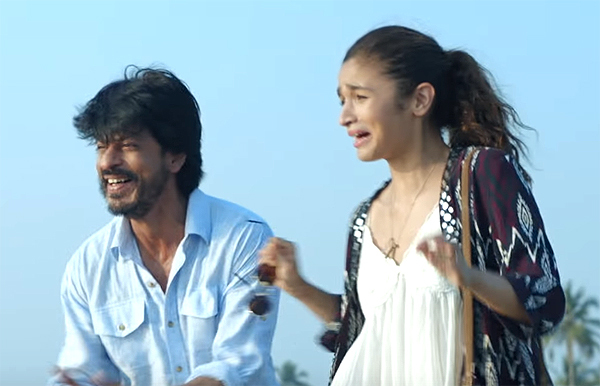 In Gauri Shinde’s Dear Zindagi, Kaira (Alia Bhatt) is a cinematographer and a talented one at that. Unfortunately, that is just to make and her pals look chilled out; her work doesn’t make any difference the plot—she could have been anything. What matters is that she is mixed up and needlessly aggressive with everyone, most of all her parents. Her topsy turvy state of mind is indicated by her deliberately turning things in her flat awry. Her attitude to men is refreshingly un-prissy—photos of her conquests are pinned to a soft board in her messy apartment. Within a few minutes of the film, Kaira has dumped one boyfriend (Angad Bedi) and is keeping another guessing--Raghu (Kunal Kapoor). But when Raghu jilts her, she goes to pieces, and not all her pals can put her together again. Getting kicked out of her apartment at the same time, leads her to Goa reluctantly and immediately get into a nasty spat with her well-meaning parents. When she can’t sleep, she finally goes to see a shrink, Dr Jahangir (“call me Jug”) Khan (Shah Rukh Khan), whose methods are casual and unorthodox. The second half of the film is one long therapy session, with corny lines being passed off a life-changing wisdom; Kaira’s troubles have a cause so obvious that had she would have to be quite brainless not to figure it out for herself. What makes the grating chatter bearable is Shah Rukh Khan’s star charm and Alia Bhatt’s abilty to sporadically channel a very convincing vulnerability that peeks from below the her “hell with love” anger. That she is able to make a not very likeable character sympathetic is to her and Gauri Shinde’s credit. The big point the film is making is that there is no shame in seeking help from a Dimaag Ka Doctor(DD), to deal with a mental problem, when there is none in seeing a doctor for a physical ailment—and it would have been significant had Kaira not seemed like a spoilt brat rather than a young woman with a serious emotional disorder. Gauri Shinde seems to shy away from the ugliness and searing agony of real mental illness, perhaps because audiences would not have been able to bear it. So she opts for the light and trite, which is such a pity.